One of the things that contractors often correct is how people pertain to garage floor epoxy as a paint instead of a coating. More often than not, you would hear homeowners say that they had their concrete garage flooring painted with epoxy. Although it is not a serious offense, it is a confusion that needs to be cleared out immediately. First off, what is the difference between a paint and a coating? Paint, as per definition, is a color or pigment that is applied on a surface as a cosmetic enhancement. Coating, on the other hand, is a covering applied on a surface as a protective or finishing layer. The confusion probably began when certain manufacturers termed some paint as Epoxy Paint. Although the paint does include epoxy in its list of ingredients, it is just a small fraction. The epoxy is meant to make the paint a lot more durable than the common house paint. It is important to know that the real garage epoxy is a coating, not a paint. It is made of two materials: an epoxy resin and a polyamine hardener. While epoxy paint can enhance the color of the garage floor, just like most paints, it is prone to scratch off, peel away, and fade. An epoxy coating, however, is tried and tested to stay intact and durable for a very long time. It is even resistant to hot tire peel and tire marks. Usually, you just open a can of paint and paint away. Epoxy needs to be mixed, blended, and then installed. It needs to be poured only on a concrete surface that also been prepared as per requirements of an epoxy coating installation. Even the thickness of the layer installed is different for both. Paint is just about 1 to 2 mm thick, whereas, a floor coating can range between 8 to 12 mm. This thickness for coatings is crucial to ensure durability and damage resistance. Paint offers a wide selection of opaque colors. Epoxy, on the other hand, offers a wider range of creative looks. You can choose the basic, opaque epoxy that looks like really thick paint. If you love the look of granite or terrazzo, a generous sprinkling of micro paint chips can acquire a similar effect. 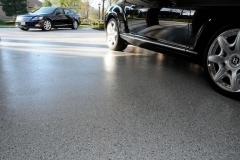 If you want something more daring and sparkly, epoxy coatings also come in metallic hues. The potential looks are almost endless. 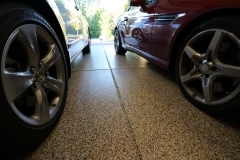 You can consult a professional garage flooring expert to learn more. The remodeling world may have terms that are quite confusing and difficult to remember, but one thing is true. An epoxy garage coating is one of the most reliable flooring materials ever made for indoor concrete floors. 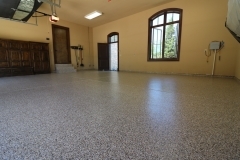 When you hire a contractor that specializes in epoxy flooring, request for a consultation. They should be able to tell you about epoxy coating, its benefits, and more. Now that you know that epoxy for garage floors are not a paint but a coating, make sure to right term always. Dallas Concrete Artisans is a proud member of the Dallas community. We are committed to create better residential and commercial properties through concrete restoration, masterful craftsmanship, and smart design. Dallas Concrete Artisans. All Rights Reserved.